I’m a dividend investor who derives dividend income regularly from a portfolio of dividend paying stocks. Sincerely, I believe all of us can move towards financial freedom through savvy stock investing. However, with that said, many had failed to build an additional source of income and grow their wealth sustainably over the long-term despite having a sincere desire to move ahead financially. So, where do we fall short? In this article, I’ll list 5 major mistakes that most people made when attempting to make money from the stock market. First, investing starts with one having an investment plan. It is likened to one planning a trip. It starts with where you are now, where you want to be, when you intend to reach your destination, and how do you intend to get there safely. Many find the subject of investing confusing. Usually, this is due to one trying to invest without having a plan beforehand. That is how most people driving around in circles when investing their money. Today, we have 900+ stocks listed on Bursa Malaysia. Which stocks should I be investing into? Logically, the answer depends on your investment plan as it helps you to select stocks that would propel you towards financial success. However, many do not bother to sit down and have their plans crafted as the process of it seems to be boring. Thus, how would most people pick their stocks? Stock Tips, Rumours, and Commentaries? Ideally, success in investing revolves around 4 words: ‘Buy Low, Sell High’. Practically, it is easier said than done. As mentioned, many bought stocks after gaining knowledge of exciting news about them. What are they usually about? In most cases, they are news about stocks which have experienced the highest appreciation in stock prices in a short span of time. Instead of ‘Buy Low’, many resorted to ‘Buy High’ as they want to join the bandwagon. This is a reality of the stock market. Stock prices do go up and come down. It is the norm and hence, a savvy investor would have prepared what to do if his or her investment in a stock falls in price. But, most do not have a plan. Therefore, when their stocks which they ‘Bought High’ drop in prices, they panic and react by ‘Sell Low’ out of fear. At these times, a savvy investor would enter the market to accumulate more of these stocks as their prices are trading at a discount (Buy Low). Hence, this brings us to the next question – What gives savvy investors the guts and confidence to invest in stocks when their stock prices drop? Investing is more intelligent when it is businesslike. It is quoted by Warren Buffett, a living legend and an example of how one who amassed billions in fortune by investing, not speculating the markets. So, what is being ‘businesslike’? It is one who views stocks as businesses which own assets and generate profits and cash flows from their customers. Thus, an investor would first study, in great length, a stock’s business models, financials, and its future plans for growth. If the stock is fundamentally solid, he proceeds by assessing its stock price and would only commit his capital into it if its prices are relatively cheap. This explains why savvy investors, like Warren Buffett, can be confident on their stock purchases in a bad market. Regrettably, many do not view shares as certificates of ownership of a business and thus, bought stocks with little knowledge on what businesses they are into and how much money they are making. It is a mistake and the biggest downfall is one who bought into stocks where their businesses are unprofitable. Think about it. Are they able to grow shareholders’ wealth sustainably over the long term? Personally, I think it is wise for beginners to start small. For instance, if you have RM 100,000 set aside to invest in stocks, it is alright to use RM 10,000 to build a mock-up portfolio to test your strategies and park the remaining RM 90,000 in fixed deposits. It is wise to be conservative at the start. You can expand your portfolio as you gain wisdom and experiences of profiting from your stock investments. Regrettably, many tried to be aggressive right from the start. They started with investing capital instead of getting education. It is not a wise move. Knowledge and wisdom are currencies to make money consistently in the stock market. In most instances, they are more profitable than just money itself. In short, it does not take a genius or a crystal ball to build a stable and a regular source of income from stock investing. It takes a plan, logic, willingness to learn and a business mindset to profit consistently from the stock market. Cheers! « Previous Post Most Common Payroll Mistakes in Malaysia Next Post » Oh No … My Loan Application was Rejected! 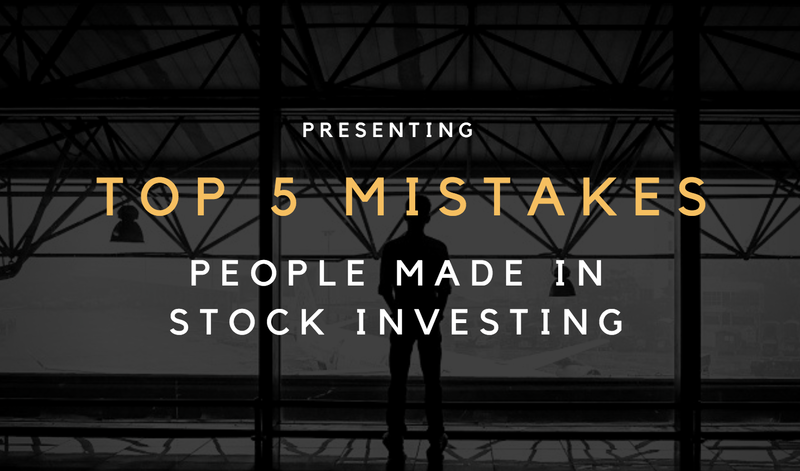 4 replies to "Top 5 Mistakes People Made in Stock Investing"
The four key element. I”m interested on the future financial goals. Will there be any articles on this? What goals example should us like newbies set? Good Idea. I can write one on it. With it, I would provide a list of examples of what goals to set. Stay tune for that. Ian. I admire this Informative content 5-mistakes-in-stock-investing excellent wording. I got so involved in this material that I couldn’t stop reading. I am impressed with your work and skill. Thank you so much.